Advantages: Diverse range of techniques used, quality results, methodical explanation of methods. Figure painting is hard enough without worrying about intricate uniform details. The camouflage worn by the Waffen-SS can pose all sorts of challenges and those of us that have tried their hand at painting this know the potential heartache that awaits. Here is a book designed to help alleviate any fears. 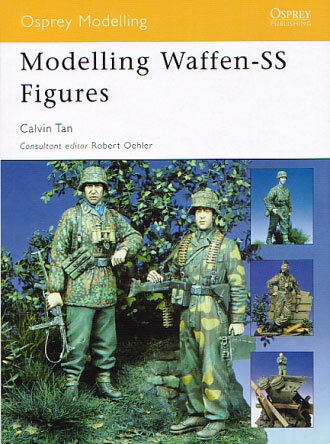 Accomplished figure modeller Calvin Tan takes the reader through a series of chapters, each introducing a new set of skills. These skills increase in complexity until ultimately, the modeller is exposed to techniques for designing ones own figures. The book consists of eighty pages and contains over three hundred colour photographs. This number is necessary due to the step by step nature of the illustrated techniques. The images are well produced and although there can be as many as six per page, this in no way detracts from the lesson being taught. Also dispersed throughout the book are five colour charts. These show the various patterns seen on the soldiers and represent the “Plane tree”, “Dot/Pea”, “Italian”, “Oak-leaf” (spring) and “Oak-leaf” (autumn) examples. Matched to the colours used are the appropriate Vallejo paints (which the author uses) and the proportions used to mix the different shades. All of the figures worked on in the book are in 1/35 scale although you would swear they were larger when looking at the quality of the finished product. A number of different plastic and white metal subjects are used but obviously the techniques can be applied to resin figures as well. We start the book with a project that teaches the reader how to paint a camouflage smock. Simple techniques on how to improve the figure is also covered as well as the task of painting faces. Techniques for improving the soldier’s equipment, the way it’s carried and even creating a simple base, all come under the spotlight. The second chapter is a bit more involved as a tank crew member has his overalls converted into a jacket and painted in the “dot pattern” camouflage. The author shows his deceptively simple way of using rolled putty of various shapes to achieve his goal. Chapter three continues this theme except the conversion is a lot more complex and two figures are involved. Super detailing these items is also covered, with the use of photo-etched parts, rod, tube and the inevitable putty; the making of a MP40 stock being particularly interesting. The last section sees the biggest challenge tacked…the dreaded sculptured figure. The author takes a commercial head and proceeds to build a body under it. The methodical approach is easy to follow and does convince the reader that it is possible! 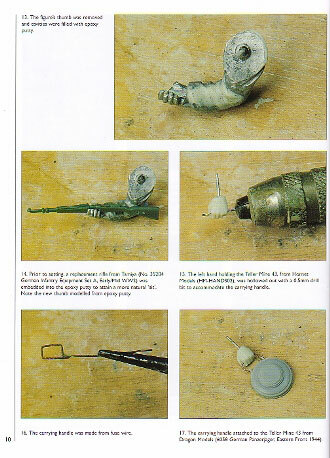 A list of recommended figure sets and accessories rounds out the book, complete with a table of books for further reading and research. This is a well thought out book with plenty of advice to convince the reader that they too can accomplish first class results. The logical layout displays the author’s full range of skills, from basic painting to creating a whole new figure. Applying these talents to the popular subject of the Waffen-SS will ensure a deservedly wide readership.